This friendship combines in a special way their strengths and loyalty and leads them to accomplish many great things together. The friendship between the Aries and the Leo can be truly fulfilling for both these natives, who always keep wanting more from each other. Warm and caring, the Leo can make the Aries softer with their generosity as far as both gifts and compliments go. However, the Aries must keep in mind the Leo needs to be treated like royalty. It can be challenging for a Ram to praise a Leo because Arieses usually want to be themselves first. Both the Aries and the Leo have great energy, which means they can keep up with one another and have fun, considering they simply love leading an exciting life. The Aries and the Leo are signs that belong to the Fire element, but the first is more interested in adventure, while the second wants comfort and to live in luxury. Furthermore, these two are passionate about sports and competing, which means neither of them knows how to lose and that arguments between them are almost inevitable, especially when they’re playing a sport. However, they won’t mind to most of the time enjoy one another’s so-called celebrity and success. The friendship between them is very efficient and fun because they’re both interested in the same things and have similar levels of energy. People will notice them wherever they may be going because their connection is harmonious and the things they’re doing seem to always put them in the center of attention. It can be easy to observe how great friends these two are and how easily they can support one another. Other signs who happen to be companions will truly envy them because they seem to shine, especially when they’re best friends. 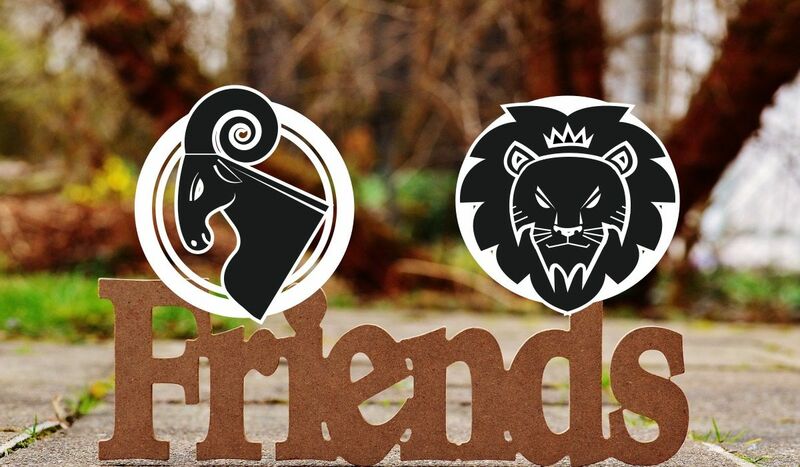 The friendship between a Leo and an Aries is passionate and full of energy because both these signs enjoy taking part in new adventures, dealing with challenges and competing in a healthy way. These two will always push one another to achieve great things, which means they can never get bored when together. However, because they both have great egos and want to lead, they may often fight for the domineering role. In spite of this, the respect and admiration between them will always be first, but they should learn how to give each other the opportunity to rule in their partnership, especially if they want things to be smooth between them. All in all, the friendship between an Aries and a Leo is based on competition, leadership and great energy. If these two don’t want to fight, they need to not allow themselves to become very competitive, especially when spending too much time together. Both proud, they can have arguments starting with any little discussion, but at least they’re never getting bored as friends. The Aries can show the Leo how to take advantage of good opportunities, so no matter what differences these two may have, it’s still very possible for them to enjoy a harmonious partnership with one another. If they’ll respect each other all the time, others will do the same with them, which means they can be very appreciated in their circle of friends. There are many reasons as to why the Aries and the Leo can be best pals. For example, the Leo loves to be in control, to get involved in arguments and to lead. The Aries knows how to rule too, but doesn’t mind allowing others to sometimes take control. Therefore, the Aries doesn’t need the leadership role that much. Furthermore, both of them are sincere and not bothered by hearing or speaking the truth. Neither of them wants to give up his or her independence, so they can hang out together without feeling tied down to one another’s plans. Therefore, they can be very relaxed when together, even if they’re known as agitated when separated. Leos tend to be very proud of their friendships and are usually devoted, kind and generous. These natives know how to organize things and don’t mind supporting others. When being good friends with a Leo, expect him or her to always want the spotlight and to demand respect, loyalty and appreciation. Many think Leos as friends are little bit arrogant and too passionate, but this is not something everyone says. It’s not easy to come into their life because they have big egos and tend to keep their social circles very small. Furthermore, when wanting to be around a Leo, people must always praise this native and make him or her expensive gifts. The Aries is governed by the planet Mars, while the Leo by the Sun, which means both these signs have only masculine energies. The fact that they’re similar when it comes to their personalities means they can understand each other very well. The Sun stands for everything that represents the self, while Mars deals with war. This also means they’re all the time at extremes and can have fiery debates in which they may hurt one another’s pride, yet they can never get bored when together. Both these natives want to rule, have an amazing optimism and levels of energy, can’t stop hurrying and possess incredible power. After a fight, neither of them holds grudges and they just prefer to move on to the next adventure in which they can take part together. They should be able to notice the respect between them is tremendous and that neither wants to offend. While the Aries is cardinal, the Leo is fixed, which means the first can reassure the second problems can easily be dealt with. In return, the latter helps the former finish projects and to move to the next idea only after the first has been completed. The Leo may get annoyed seeing the Aries is too impulsive and that he or she can’t hold onto something for too long, while the Aries may think the Leo is too commanding and always in need of attention. In spite of all this, these two really care about one another and are very devoted to their friendship. It’s essential for them to realize their partnership doesn’t necessarily need someone to lead. Those who are friends with Arieses will never regret having these natives as companions, regardless of how impulsive, quick tempered and fussy they can be. And Aries will never care if his or her friend doesn’t look too good or didn’t put on a formal outfit because Arieses don’t care about appearances. Furthermore, when feeling down, the Aries can always be counted on for eating chocolate and watching TV, not to mention people in this sign are always up to do something and want to just spend their time having fun. It’s impossible to ever get bored around them because they can turn a family reunion into an outstanding party. It’s like they always have what’s needed for partying and especially the spirit. However, an Aries can get sick very early in his or her life as a result of having too much fun. When doing nothing, the Ram gets nervous and starts to look everywhere for excitement, thrilling situations and more adventures. The Leo pays very much attention when choosing his or her friends because natives of this sign need to always be in the center of attention and for others to admire them. When it comes to this, the Aries has more independence and doesn’t really care about how people see him or her. When it comes to their similarities, they both care about loyalty and couldn’t resist without it. It’s impossible to betray them and after to have their friendship back. This means they have the same values and can’t really hurt one another as they have too much respect for friendship. While sometimes competing, they’re usually very good at partnering up and would never stop supporting each other. They may sometimes fight, but the overall feeling of their partnership is of being there for one another. When colleagues, it’s very likely the Leo is the one with an executive role, even if the Aries has great managerial skills as well. The Leo loves to lead and would never be arrogant or irresponsible. These natives are known to function better when working in teams. The Aries prefers to do things alone and doesn’t want too many people in his or her business. While these two have the same energies, there are also many things that make them different. The greatest thing about their friendship is the fact that they can combine their strengths and accomplish many great things while also admiring and respecting one another. The Aries can take the initiative and make things happen, whereas the Leo has the power to see their common projects get completed. If these two will decide to let their pride aside and just give in when fighting, they can move mountains if best friends.